> Blog >	Bridgestone Battlax R11, an evolution. Good description of the articles, very competitive prices and very fast delivery. Bridgestone Battlax R11, an evolution. When Bridgestone released the Bridgestone Battlax R10 tires, the engine professionals were totally surprised. Its new structure offered the pilot greater maneuverability of the motorcycle and that translated into an improvement in lap times, now the Japanese giant returns to surprise us with its logical evolution: the new Bridgestone R11 Battlax. For many years the Japanese brand was the only supplier of tires in the MotoGP category. That allowed him to acquire a knowledge to be able to manufacture circuit covers with which to compete at the highest level. The performance of Bridgestone tires has always been praised by racing drivers. 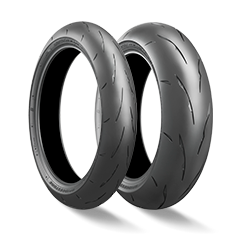 Backed by the quality of all Bridgestone tires, the Bridgestone R11 tires have been designed to become the owners of circuits in terms of performance.. In addition to the increase in the contact footprint, the big difference with respect to the Bridgestone R10 tires, and this must be taken into account, is that the Bridgestone R11 have not been approved to be used outside the racing circuits. The structure of the tires itself has a new arrangement that allows permutation of the rigidity on the entire surface of the tread thereby increasing the contact surface of the tire, in addition, the composition of the tires increases grip, duration and its consistency. The warm-up time of the Bridgestone R11 tires is much shorter than in their predecessors, the battlax R10. The innovative position of the grooves, which results in maximum contact in the acceleration phase, allows for better heating times. Evolving the construction of the Mono Spiral Belt (V-MSB) already advanced in the previous model, an increase in the pressure on the contact zone and a greater force in the curves is achieved, which is also perceived on the straights. The feeling of contact increases and, consequently, the confidence of the pilot is greater. The increase of the traction power, the constant performance throughout the life cycle of the tire and the greater grip in all the phases, are its main characteristics. Bridgestone has tested the R11 tires in circuit. The conclusions are evident: lap times are improved by 1.3% with respect to their predecessors. Translated into seconds, it means a reduction of 1.5 seconds per lap (in a speed circuit lasting two minutes per lap). Bridgestone R11 tires are also available in sizes compatible with Supersport 300, Supersport 600 and Superstock / Superbike 1000. With the release of the Bridgestone R11 tires, the Japanese brand has a clear objective: to achieve the maximum performance in the circuit to enable greater confidence of the pilots..
V.M.S BELT, evolution of the "mono spiral belt" whereby with a single thread of continuous form it is possible to cover the entire tire tread area, thus avoiding the overlapping of layers or the use of splices, achieving a more uniform that moves to an improvement in stability, absorption and damping. G.P. BELT, directly from the speed circuits, with this technology Bridgestone manages to increase the pressure of the contact area of the tire, ostensibly improving the performance of grip in any situation and type of driving. H.T.S.P.C., as a point of view, the maneuverability of the tire to make it adaptable to all kinds of situations, thanks to a construction based on the use of steel filaments superimposed in spirals and augmented in a rubber coating, creates the so-called Mono Spiral Belt, whose main characteristics are to provide the covers with greater flexibility, reduction of heat generation and greater stability without penalizing absorption. U-EYE, "Ultimate Eye", very innovative technology developed by the Bridgestone I + D department that is capable of reproducing real driving conditions in a closed circuit (expansion developed in the Bridgestone S21), so that the behavior of the tire is displayed in detail at different speeds and conditions, monitoring at all times the distribution of the pressures in the tread area, in such a way an optimal combination of the compounds used in the design of the tread and the profile of the tire is achieved..
Second Hand Spare Parts Motorcycle. Dismantling and cutting Motorbikes, sale online around the world. We only use your email to send you our promotions and offers about used motorcycle parts.